Traditional Catholic Revival of the Knights Templar! Recently I became a postulant for the new order of Knights Templar, officially known as the Christi Pauperum Militum Ordo ("Order of the Poor Knights of Christ"), or simply the Ordo Militiae Templi ("Order of the Militia of the Temple") for short. It is a traditional Catholic revival of the Knights Templar, created in Siena, Italy, in 1979 and approved by the Archbishop of that city. Its mission, in general, is to fight for rights of God and of Catholicism; in our age of crisis, this means to fight for the restoration of the Latin tradition of the Church. Please pray for me and for my wife (she is a postulant to become a Dame) in this exciting time in our lives, as we go through our formation process, which, after a brief, 30-day postulancy period, will consist of a two- to three-year novitiate, where we are required to recite the traditional Divine Office daily in Latin, to recite the (traditional) Rosary daily in Latin, to assist the traditional Mass as frequently as possible, to study assiduously and live out the spirituality and culture of Christian chivalry, and, in general to invest our energies in the restoration of Catholic tradition. At the end of the novitiate (in two or three years), "si Deus lo vult," we would travel to the Castello della Magione (near Siena) for my investiture as Knight in Obedience and for my wife's becoming a Dame. 1) Read the article below, from Wikipedia. 3) Email your local preceptor (contact info in the website) about your interest. The Propreceptor for North America is Bro. Charles Adams, CPMO (usa@ordo-militiae-templi.org). The Militia Templi is a Roman Catholic lay association of the faithful that celebrates its liturgy according to the traditional form in place in 1962, often referred to as the Tridentine Mass. Founded under the authority of the Archdiocese of Siena, the Militia Templi's focus is knightly and monastic and members follow a modern adaptation of the Rule written by St. Bernard of Clairvaux for the ancient Knights Templar. The order makes no claims of direct descent from the old Knights Templar and holds that, when made, such self-styled claims are both historically and canonically false. The Militia was formed civilly and with the approval of the local ordinary on September 21st, 1979. Its Constitutions were approved on Sept. 8, 1988 by the Archbishop of Siena Msgr. Mario Jsmaele Castellano. The next Archbishop, Msr. Bonicelli approved the Rule of the Militia in 1990. 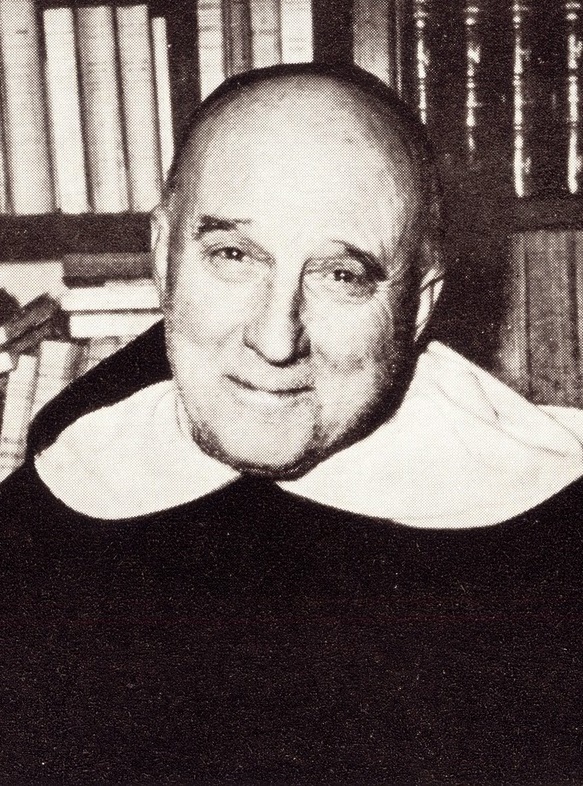 The Cardinal Protector of the Militia is Édouard Gagnon. According to their Constitutions, the Militia has both married and celibate members. The knights with solemn profession (Doms), who consecrate themselves perpetually to the Militia with the investiture and the promise to observe the three classic evangelical counsels (poverty, chastity, and obedience) as well as the public testimony of faith (fourth promise), and the non-professed knights (Brothers or “Knights in Obedience”) who, with the investiture, commit themselves to strive for the perfection of Christian life. The knights have no particular apostolate or pastoral engagement other than public testimony of the Catholic Faith. They are obliged to live by their Rule and recite daily the Hours of the traditional Divine Office. Their members include hundreds of Knights in Obedience, about 30 Knights with Solemn Profession, 10 national preceptories, many local priorates and scout groups. 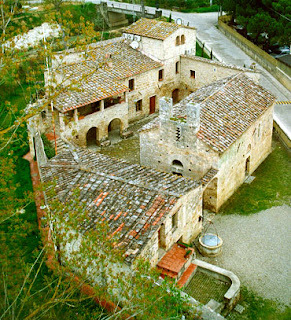 The order's Magistral See, or headquarters, is situated in the Castello della Magione. It is a former Templar compound that lies in the village of Poggibonsi in the Tuscany region of Italy. Built in the 11th century, the castle was donated by it’s owners, Gottifredo di Arnolfo and Arnolfino di Cristofano, to the Monks of the Saint Michael Abbey in Poggio Marturi, who later bestowed it to the Templars for use as one of their numerous Mansiones or Domus Templi along the Via Francigena. After 1312, the Castello della Magione passed though many hands, including the Hospitallers and the Princess Corsini, until, in 1979 it was purchased by Count Marcello Alberto Cristofani della Magione, the founder and current Grand Master of the Militia Templi. Attached to the castle is a church, also restored, with impressive Burgundian-Cistercian influence and is used daily by the order for the community recitation of Vespers and the celebration of the Tridentine Mass. The symbol of the Militiae Templi is a Red Octagonal Cross, symbol of the Eight Beatitudes of the Gospel, while the symbol is a white flag with Red Octagonal Cross. 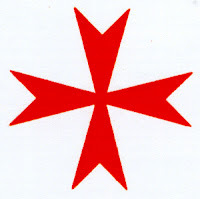 The cross is not to be confused with that of the medieval Knights Hospitaller, which is known as the Maltese Cross. The Grand Master has as its coat of arms just and symbol. The habit of the Professed Knights is white and consist of the tunic, the scapular with the octagonal red cross on the chest and a mantle with a cowl and the same cross on the left shoulder. The Knights in Obedience wear a mantle without cowl but with an octagonal cross on the left shoulder. The Ladies wear a white mantle and a white veil with the cross without the upper arm The Chaplains are dressed with a white Mozzetta with red edge, red buttons and an octagonal red cross on the left front part. 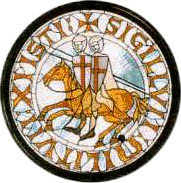 The Oblati (Knights and Ladies of Devotion) have a gray mantle with the red octagonal cross on the left shoulder. The Militia Templi through Preceptories or Magistral Legations, is currently present in the following countries: Italy, Australia, Austria, Canada, Germany, Switzerland, United Kingdom and Ireland, Poland, Romania, Hungary, Spain, United States of America, and Puerto Rico. It means: "May the Virgin Mary with her Loving Offspring bless us. Amen." But, if you ask me, it sounds a million times better in Latin.